The mobile ecosystem contributed 6.2% or around $13 billion economic value to the GDP of Bangladesh in 2015. This figure is inclusive of the direct economic impact of mobile operators and the broader ecosystem as well as the indirect impact and the productivity increase brought about by the use of mobile technologies. The mobile ecosystem also provided both formal and informal employment to over 760,000 people in Bangladesh. It made a significant contribution to the funding of public sector activity, exceeding $2 billion in 2015. More than 30% of the jobs were created directly in the ecosystem, while the rest were generated indirectly in other sectors as a result of the consumption of inputs generated by the mobile sector. 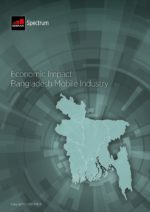 At the end of 2017, Bangladesh became the fifth largest mobile market in the Asia Pacific and ninth largest in the world, with 85 million unique mobile subscribers. Subscribers owned an average 1.7 SIM cards amounting to a total 145 million connections and representing connections penetration of 87%. Majority of subscribers in Bangladesh mainly use their mobile phones for basic voice and SMS services. Because of this low level of engagement, the country generates one of the lowest subscriber ARPU levels in the world, at $2.9, significantly below the averages for Asia Pacific and the world of $10.4 and $14.6 respectively, limiting the ability of operators to engender the required transition to mobile broadband technologies. However, the slow transition to mobile broadband technologies such as 3G and 4G in Bangladesh were the result of delays in timing. The 3G and 4G spectrum auctions were both subject to numerous delays, taking place in in September 2013 and February 2018 respectively, making Bangladesh one of the last countries in South Asia to award licenses for the technologies. It is expected that over the next ten years, a combination of improving affordability (driven by falling smartphone prices), greater network coverage and technology advances (through the launch of 4G services) would enable Bangladesh’s transition to mobile broadband technologies to accelerate out to 2025. Nevertheless, the 3G life cycle has yet to go a long way before reaching maturity. 3G connections are expected to surpass 2G connections in 2020, reaching 46% of total connections – which requires continued investment and maintenance on behalf of mobile operators. 4G adoption is therefore expected to initially lag that of 3G in the years following the launch of services, but will accelerate out to 2025, at which point 4G will represent half of total connections. In Bangladesh, the total cost of mobile ownership (TCMO) of a Low consumption basket (500 MB of data) represents 4.9% of monthly income for those individuals within the bottom 20% income group, which is just under the affordability threshold of 5% suggested by the UN Broadband Commission (UNBC). Promoting and extending connectivity has the potential to deliver significant social and economic benefits, as well as tackling some of the challenges, as Bangladesh progresses towards a digital society. It is therefore important for regulatory and legal environment to recognize that mobile industry dynamics have evolved in recent years. The industry started experiencing rapid growth in terms of number of subscribers and unique subscribers during mid 2000s and as the price of mobile devices and call rate decreased, the number of unique subscribers increased. The mobile market in Bangladesh involves four licensed mobile operators: Grameenphone, Robi (which recently merged with Airtel), Banglalink and state-owned Teletalk. Currently, virtual network operators (MVNOs) do not operate in Bangladesh, however the BTRC has been assessing the feasibility of allowing them to enter the market. second largest operator by number of connections. At the end of end of 2017, Grameenphone held a 46% share of total connections, followed by Robi (28%), Banglalink (23%) and Teletalk (3%). CDMA-based Citycell (Pacific Bangladesh) had effectively been closed since final quarter of 2016; the BTRC suspended its operating license due to nonpayment of dues. lowest subscriber ARPU levels in the world, at $2.9, significantly below the averages for Asia Pacific and the world of $10.4 and $14.6 respectively, limiting the ability of operators to engender the required transition to mobile broadband technologies.